When I recently found myself needing to use crutches, I realized that I didn't have a cute backpack. 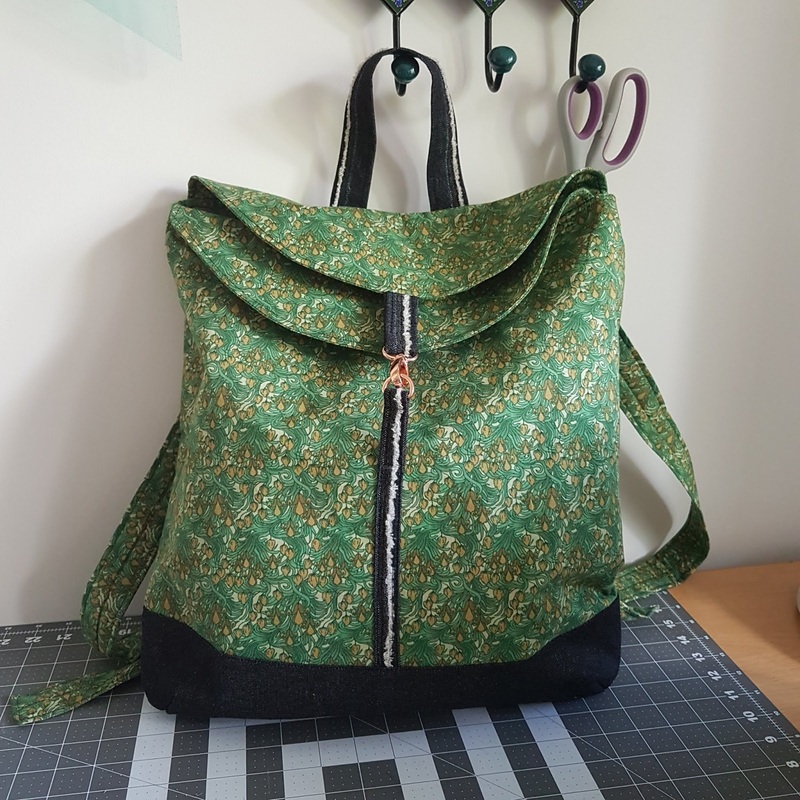 I've made plenty of handbags, totes, zipper pouches etc but never a backpack! 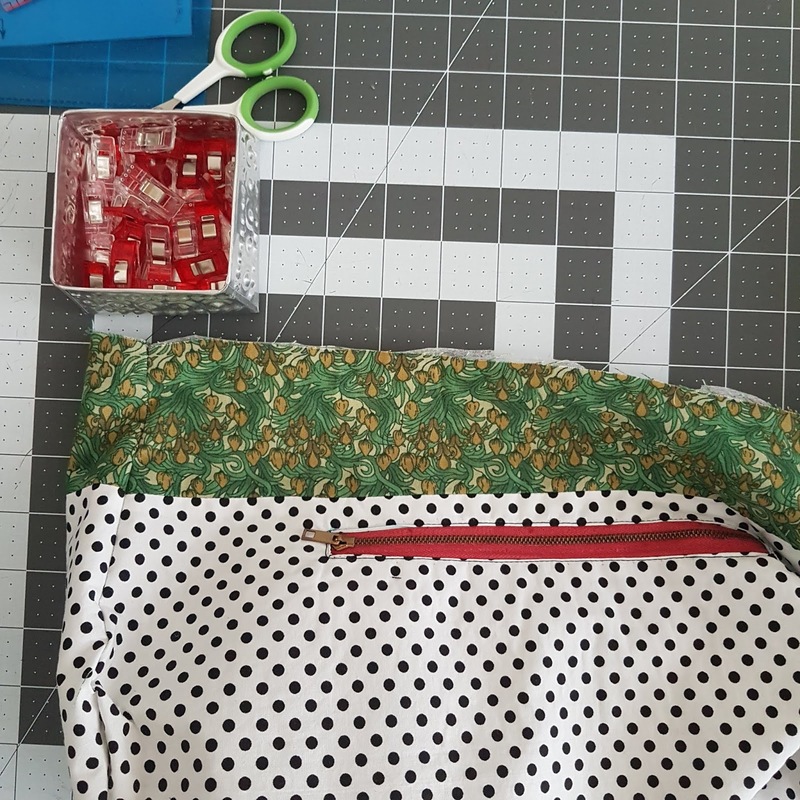 I added 10cm (4 inches) to the length of the bag (remember to add to exterior fabric and lining!) and omitted the exterior pockets. I added a top handle, attached between the top flap and back panel so I could hang my backpack. I added straps, also attached between the top flap and back panel. I made my straps the length of my fabric width and 10cm wide. 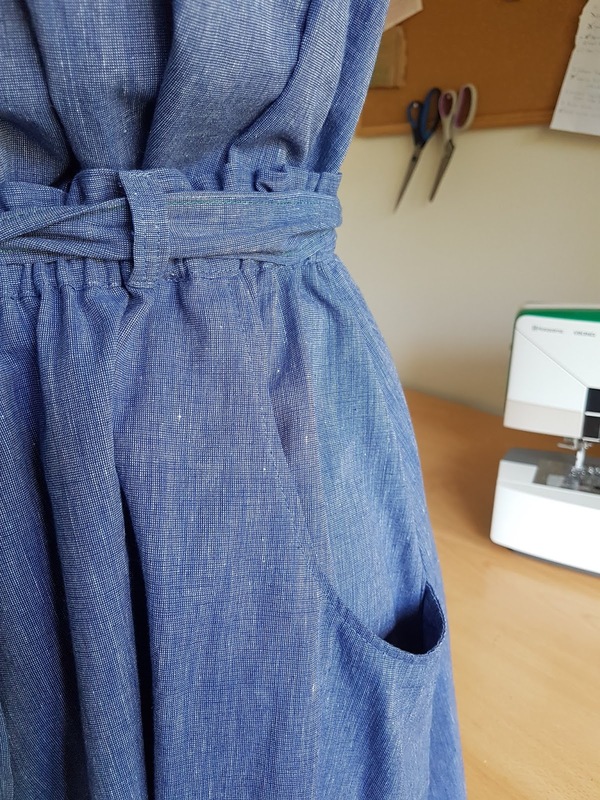 I then sewed a fabric tube and inserted a strip of fleece lining to give it some substance before top stitching the straps to hold it in place. I placed my straps 6 inches apart, but that was just personal preference. I didn't have any adjustable strap sliders on hand (and wanted to finish my backpack ASAP!) so I knotted my straps to the D-rings, that way they are still adjustable for when one of my daughters want to borrow my backpack. I would recommend using the adjustable strap sliders! For my fabrics, I used quilting cotton (which I interfaced) for the main body and rigid denim for the base and accents. 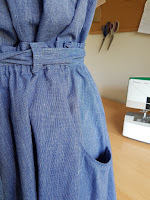 I loved the selvedge edge of the denim, so I used it as a feature on the top handle and the closures. For the lining of my bag I used a polka dot cotton. 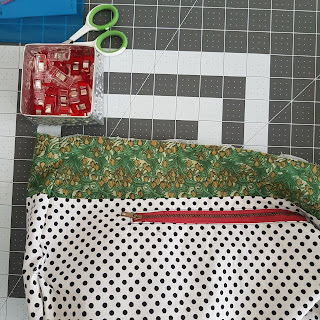 You can see a peak of the lining on the sides this bag, so I cut 5 cm off the top of my lining pieces and added a 5.5 cm piece of the main body fabric. My rose gold swivel clip is available from WhoSaysSew.com Pretty hardware makes such a difference to your makes! I've always been passionate about ethically made fabric (and clothing). That's part of my motivation for sewing, not supporting fast fashion and unethical manufacturing practices. I also don't like buying fabric of suspect or unknown origins...it's just fast fashion by the metre! I always try to seek out fabrics made in countries with fair work practices or fabric which is handmade and purchased from the weavers. Two years ago, when I was in Bali, I saw a woman sitting & weaving fabric at loom. It was mesmerizing! Naturally, I bought a few metres of fabric! On that same trip I met the owners/patrons of Threads of Life Bali, a shop and organization which supports traditional textile manufacture. An art which is diminishing rapidly as young women don't want to learn the art of weaving as they can earn a better living in more modern occupations. Traditionally men do the farming, growing the cotton and dye plants and the women weave. Textile production sustains and provides work for all members of the family and is being lost. That stayed very close to my heart for the past 2 years and I found myself wondering if I could do something to help support the handwoven textile industry in Bali. Last month I traveled back to Bali with my little family. With the assistance of a friend who lives in Bali I was able to find handwoven fabrics which were suitable for sewing with. These beautiful handwoven 100% cotton Ikat and plain fabrics are just amazing. AMAZING! The detail and repeats in the Ikat look like they must have been done by machine, but no. They are expertly woven by kind & shy women who have worked at the looms for most of their lives. Each day they gather and chat while they weave with the clicking of the looms a constant rhythm in the background. With the assistance of my friend as translator I purchased some beautiful Ikat and plain fabrics. To call them "plain" doesn't do them justice! Most have different coloured warp and weft threads which gives the cottons almost a shot silk appearance. As the fabrics are handwoven they are a slightly looser weave than machine made fabrics, which makes them so soft with a slight drape. The best part is that they get even softer with washing! Of course, handwoven fabric has to be carefully cared for (cold delicate wash, and I wouldn't put it in the dryer). To be making something with my hands which has been handmade by someone else is just so appealing to me. It feels even more special! So I went back and bought more fabric! My thought was that if I am so in love with these fabrics, maybe some of my wonderful sewing community would be too. This fabric is unique and unlike anything else I've seen for sale. I've only ever seen Ikats with 2 colours for sale online, these are much more complex with 4 or more colours. To start, I've opened an etsy shop (search for HonourHandmadeFabric) and will list the fabrics I have for sale (I will ship worldwide). Let me tell you, the struggle is real to part with them as I love them all!!! My hope for Honour Handmade Fabric is that I will be able to grow it into something meaningful. Ideally, I would love to work with the weavers in Bali on a large scale, not only providing income but being able to assist with social support for the women which is often lacking (education, healthcare, childcare). I would love to make the art of handweaving fabric sustainable for these women and encourage younger women to learn so the skills are not lost with the passing of the older generations. I want to be able to support my family (as many of you know, my Hubs underwent his 2nd surgery this year to remove another brain tumour) and the families of the weavers. Of course, these are lofty goals. A lot of people, whose advice I value, say you have to have a big vision for your business! But from little things, big things grow! I sincerely believe that the small seeds of passion that are planted in our hearts are there for a reason, if we choose to act on them. This fabric was gifted to me by The Delhi Store. My love for this fabric is real, and not sponsored! As a maker, I value handmade. So many fabrics are mass produced that I feel like I'm falling into the "fast fashion" trap when I buy them, although I am making my garments I still wonder "who made my fabric"? When I was contacted by The Delhi Store (soon to be launched as Fabrics & Notions website) I was thrilled! Their fabrics are sourced directly from the Artisans across India and are all handmade. 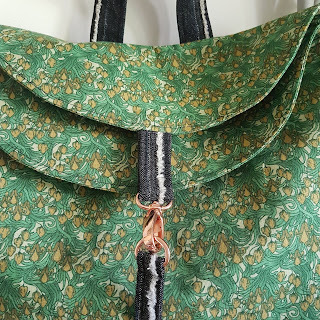 There is something so special about sewing with handmade fabric! To know I'm creating with my hands, with something from the hands of another maker gives me all the good feels! Eclectic collection of handloom fabrics, hand block printed fabrics and vintage sarees. I've been fascinated with textiles for as long as I can remember. As a little girl, I was in awe of my granny's and mother's beautiful saris. I remember, that once my grandma gave me an old blue silk georgette saree to play with, that had beautiful metallic dots all over, and I used it as a canopy over a small tree, and imagined it was a beautiful night sky full of bright, little stars. After completing college and working in IT education for a while I left my job as I wasn't enjoying it much. I have always been the creative type and an admirer of handicrafts of all sorts. I am especially drawn to the centuries old art of making hand printed, handwoven, hand embroidered textiles. Within India, there are so many types of weaving, printing and embroidery techniques that are practiced. Sadly, these techniques are dying a slow death, as the artisans don't get what they deserve for their hard work.This is my small endeavour to save these intriguing techniques from vanishing completely. You might get such fabrics much cheaper elsewhere but think before you buy; are you contributing to sweatshop practices? With the beautiful cotton chambray I was gifted I made a self drafted elastic waisted midi skirt (with pockets I copied from an 80's McCalls pattern and use whenever I can!!). 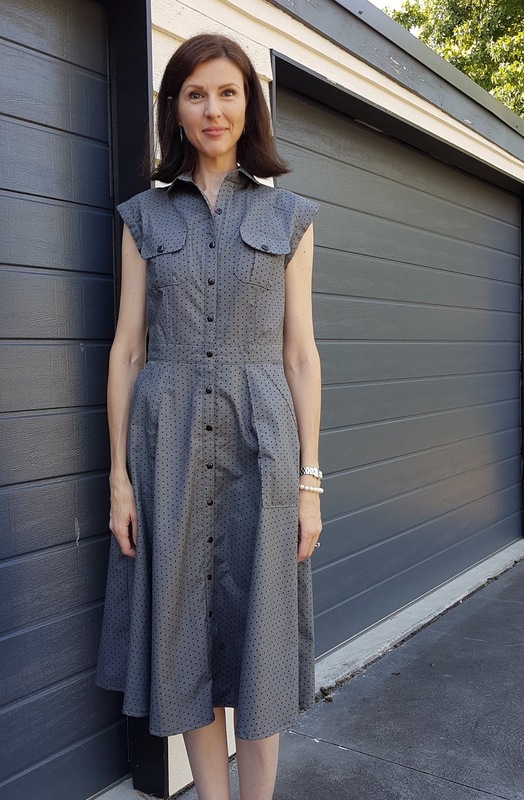 The top I made is the top from the Kate Tea Dress by Designer Stitch. 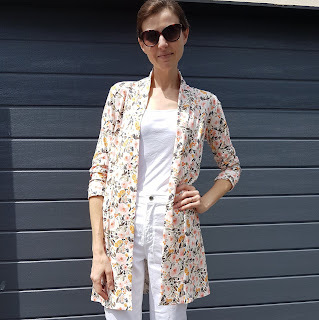 This dress pattern also gives you the options of making separates, which I think is awesome! I added 5cm to the top length for my height. The fabric is beautiful quality; much better quality than the price would suggest! Handmade fabric always has slight irregularities, however it's part of its charm. This fabric is lightweight, but not sheer, with great drape. 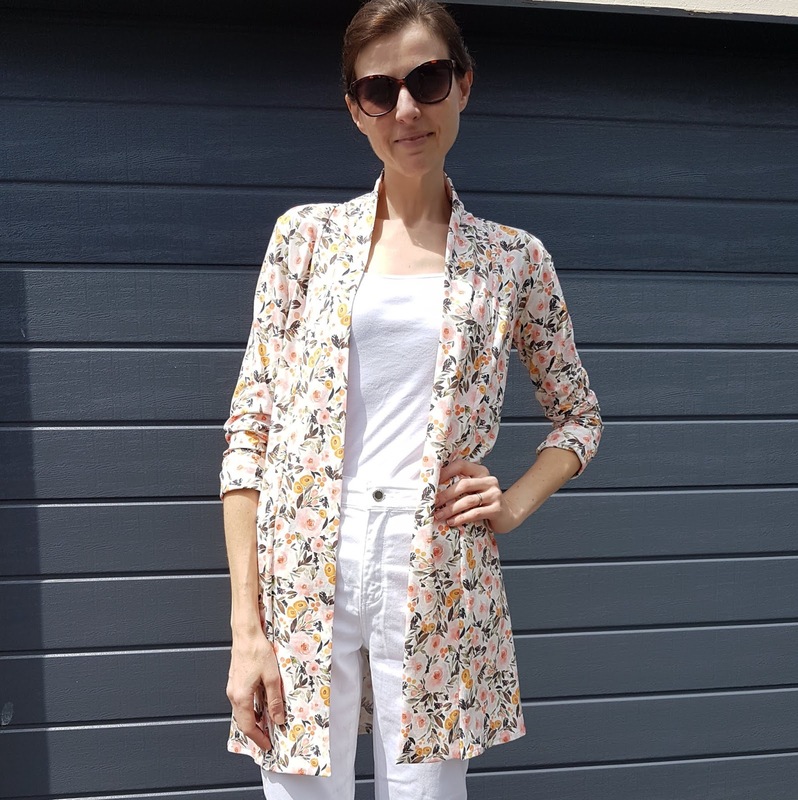 It will be perfect for summer! 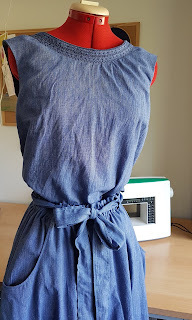 I used some decorative stitches around the neckline of my top (you can read more about that soon on the Husqvarna Viking Australia blog). I'm still having so much fun with my Designer Jade 35 machine! I love that it feels like a machine I won't "outgrow" as I'm always discovering new stitches! If you follow me on IG you'll know that I've just come back from Bali. I was SO inspired by and impressed with the skills of the Balinese textile Artisans. I was lucky enough to see cotton being dyed and to watch hand weaving which was truly hypnotic! Beautifully woven plains, breathtaking Ikat's and dreamy batik fabrics are all made on the island of Bali. Sadly, the traditional textile industry is diminishing due to industrialization. Machine made fabrics are faster, cheaper and can be made in larger quantities. Young people are not learning the textile arts from their elders because they can't make a living from it. I was really touched by that fact, and it has been on my heart to do what I can to help support these beautiful people and their amazing skills and traditions. I'm proud to be a maker, supporting other makers! It was love at first sight with the Matilda Shirt Dress by Megan Neilsen. I bought it right away, glued together & cut out the pdf (yes, I prefer glue to tape. It's a controversial divide in the pdf pattern community!!!) and then it sat in my sewing room. I even had the perfect fabric for it in my stash! At the time I was using a vintage machine, which meant manual buttonholes. Try as I might, my buttonholes were always different sizes which made me crazy!! You can read more about my experience with my new Designer Jade 35 machine over on the Husqvarna Viking Australia blog. To make this pattern fit me, I added 2.5cm to the bodice length (may do slightly less next time) and 10cm to the skirt length. I graded between XS & S sizes too. The dress has a lot of pieces, but the instructions are really clear and easy to follow (I actually followed them!). 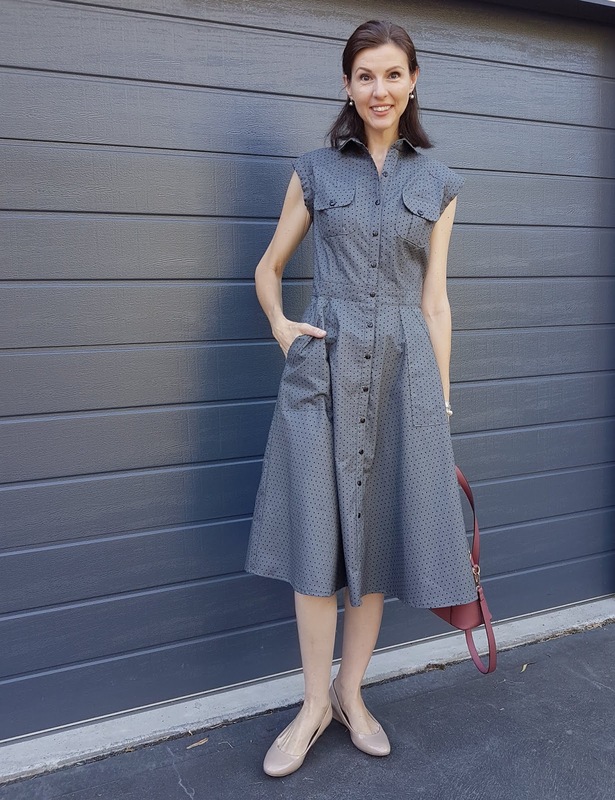 I love the fit of the dress which makes me want to try more of Megan Neilsen's patterns! I like that the waistband and yoke are lined and don't get me started on those great skirt pockets...love!!! The shape of the skirt is really great too, swishy without being too much of a fabric hog! I find that the buttons can pull when you sit in straighter shirt dresses, but that doesn't happen with this skirt. 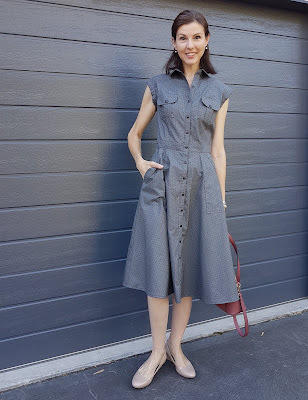 All in all, this is a shirt dress that I'm really happy with! It is a pattern I'll make again, perhaps I'll try adding sleeves for cooler weather.